There is already great anticipation for the Spring edition of CIFF. In fact, one single event will provide the opportunity to visit 4,000 exhibitors who, spread out over 750,000 square metres, will give an integrated account of their individual visions of Whole Home Décor, together with the most significant and current aspects of the sector. This is why at least 190,000 specialist visitors are expected. The 1st phase of CIFF (18-21 March 2018) introduces a full range of solutions, both classic and modern in style; a vast selection of products of different styles and typologies: home furniture, home decor & home textiles, outdoor & leisure furniture. In other words, when the product is adapted to express the personality of the person who has selected it. This is how new products are created, designed not be part of a series, but to shape themselves in such a way as to provide what the client is looking for. Products that can put themselves at the service of the user, exploiting the high-level Internet of Things technology, cloud computing and smart chips, masterfully concealed in a charming design. According to the latest figures published by the Ministry of Industry and Information Technology of the People's Republic of China, the value of furniture manufacturing exports from January to August 2017 amounted to 12.64 billion di RMB, therefore recording an annual increase of 6.2%. In order to assist international buyers, the living areas (dining rooms and living rooms) will be combined together, as will upholstered items and mattresses, ensuring that visits by operators from all over the world can be optimised and facilitated. 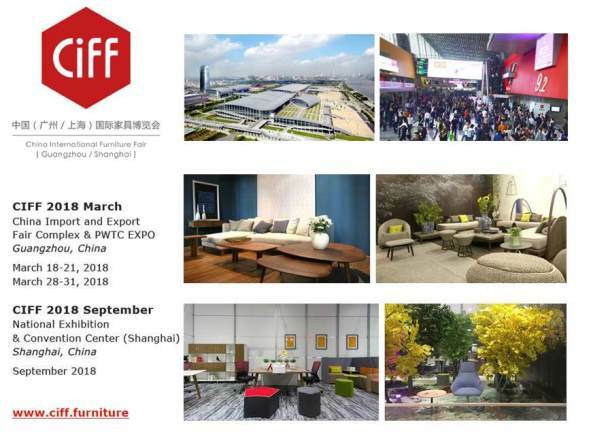 The 2nd phase of CIFF (28-31 March 2018), is dedicated to office furniture and seating, hotel furnishing, metal furniture, furniture for public spaces and waiting areas, accessories, materials and machinery for the furniture industry, inaugurating the sector dedicated to furniture for the elderly and tackling the Smart Office topic in depth. To expert eyes it is clear that the growth in the office sector has been accompanied by a great deal of research into the internet of things; objects that can interact directly with people. In effect, with life becoming increasingly fast-paced, and with very little time available, there is an increasing need for objects that are intelligent, programmable and able to ensure high-level office-people interaction. We are therefore seeing major new brands that can design and manufacture high-performance furniture. For example: Loctek, Jiechang, OMT, Aoke, CONSET, Chuangqi. CIFF has always given space to the metal furniture sector; high-performance cupboards and safes. This year, as part of the "Steel Boutique Pavilion", there will be full ranges of high-technology intelligent lock furniture that can ensure usability and unparalleled security levels. The hotel sector has undergone profound changes over the last few years, because client requirements have changed significantly. In fact, and thanks particularly to web portals, today's consumers look for hotels that are ever cheaper and, at the same time, pleasant. Hoteliers are therefore taking up the challenge and transforming their facilities in order to provide high quality at low prices. The Office Life Theme Pavilion 2018 has been designed and curated by Zhu Xiaojie, who analyses the collaborative work environment in terms of the theme "Harmony, Vitality, Beauty", where the boundaries between home and office dissolve, and where the welcoming and relaxed atmosphere sparks inspiration and increases the efficiency levels of managers and employees. Global Office Furniture Outlook, the forum organised by CIFF and Edimotion, provides professional operators and international journalists in this sector with an opportunity to discuss work environments and trends. The topic of the 9th edition is "Intelligent Office". Canton, or Guangzhou in Chinese, is the largest coastal city in South China, and the third largest city in the country, after Beijing and Shanghai. Capital of Guangdong Province, at all times a flourishing commercial center, it is definitely one of the most prosperous cities in the country. Chaotic and lively, it unquestionably provides numerous opportunities for you to enjoy yourself and relax after the fair, and to return home with a full stock of memories and photographs. Located on the Pearl River delta, the city lies just a few kilometers from Hong Kong (easily reached by train or bus); this strategic position has guaranteed Guangzhou the role of strategic port and business capital for hundreds of years. Regarded as the culinary capital of China, the cradle of Cantonese cuisine (Yuecai), here there are more restaurants per person than in any other part of China. There are only a few other cities in the world where you can savour such unusual and sophisticated taste sensations.